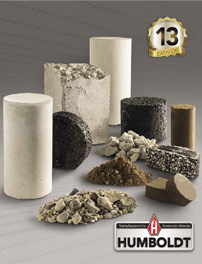 Lightweight, spring-reaction type concrete penetrometer for field and lab evaluation of the initial set of concrete mortar, based on ASTM C403. Penetration plunger has a 1/20 sq. in. tip area. Plunger is steadily pushed into the mortar to a 1" depth, as indicated on the shaft, at periodic time intervals. Penetrometer’s calibrated range is 0-700 psi. Resistance in psi is indicated on the scale. The term “initial set” is the semi-hardened, partially-hydrated condition of the concrete beyond which it can no longer be worked. The point of initial set is reached when the penetration value is 500psi. Lightweight, spring-reaction type concrete penetrometer for field and lab.